Ashutosh Gowariker's new film Khelein Hum Jee Jaan Sey went on floors on Tuesday with a mahurat in Goa. Lead actor Abhishek Bachchan and producers Ajay Bijli, Sanjeev Bijli and Sunita Gowariker were present on the occasion. The female lead Deepika Padukone will join the unit soon. Khelein Hum Jee Jaan Sey is a period thriller, which is based on Manini Chatterjee's book Do And Die, on the Chittagong Uprising of 1930. 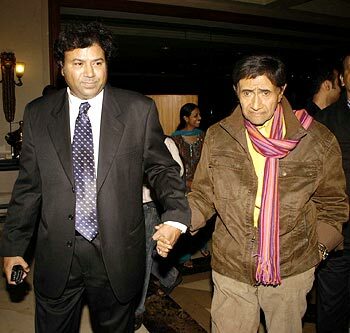 Meanwhile in Mumbai, Dev Anand attended the launch of the T20 of Indian Cinema contest, where the whole country will get to rate the top 20 movies in the 96 years of the existance of Indian cinema. Salma Hayek leaves the opening ceremony of the 33rd annual Cairo International Film Festival in Egypt on Tuesday. The festival will end on November 20. Priyanka, Lara are teachers' pets!